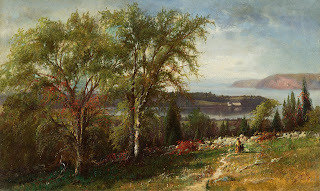 As part of the 400th Anniversary of Henry Hudson’s sail of discovery, the Alan Klotz Gallery, (511 West 25th Street, NYC) is presenting Seeing the Hudson, a major exhibition of paintings and photographs, which show the river over a period of more than 200 years, from its source in the Adirondacks, to its mouth, 315 miles away in Upper New York Bay. The exhibition will take place September 17th – October 31st, 2009 with an opening reception on Thursday, September 17, from 6 to 8 pm. The show begins with work by the 19th century painters of the Hudson River School, arguably the first American art movement, and continues through more contemporary painting and photographs. The exhibition demonstrates the variety of faces that the River presents and the selected works reflect the vision of the individual artists. In general, 19th century Hudson River School painters saw the River as an almost holy, pristine, primeval landscape, where settlers (if present at all) lived in harmony with an all powerful “Nature“. Photographers (partially due to the nature of their medium) were more interested in the real than the ideal. To them, the profound effect of the “hand of man“ on the environment is what gave proof of man’s dominion over Nature, and was itself a source of pride for a developing nation. Of course, in more recent times, man’s impact on the environment has engendered a more negative judgment. Irony and severe criticism have become part of the view as a spur to environmental action by those who love the River and want to protect, defend, and restore it. All these motivations find form in the exhibition. The Thomas Cole Historic Site is substantially increasing its online presence with the launch of a new interactive website where visitors can see Thomas Cole’s paintings in a new way, enabling a greatly enhanced understanding of the artist and his work. The Thomas Cole Historic Site has announced that it has received a bequest of $1,000,000 from the estate of Raymond Beecher (1917–2008), a guiding light in the preservation of the Thomas Cole Site as well as countless other historic properties in the area.